By JKent, January 28, 2008 in Members Pictures - Speakers, Electronics, etc. This is my second Thirteen restoration, and it was a challenge. Before & after shots below. I patched and filled the veneer, cleaned it up, and took it to Bristol Electronics in HoHoKus (yes--that's a real place) NJ. Tim is an ace. He replaced several caps, 1 pot, and the AC outlet. Cleaned the switches and controls, and aligned it. The only thing he could not do is find knobs. The originals were ivory. One was missing, and when the off/on/treble pot was replaced the new one had a solid shaft--not splined like the original. 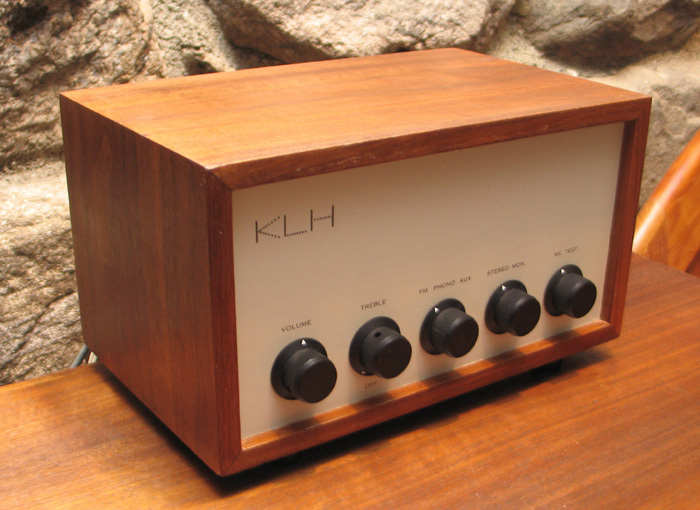 I decided to use some nice expensive solid aluminum knobs that are a good match for the black plastic knobs on the KLH Model Eight. Fifty bucks worth of knobs! But I think the result is quite nice. Super restoration job on the Thirteen. Hope it sounds as good as it looks, but know it will if Tim fixed it. He does fantastic work on old Hi Fi stuff. The black knobs look just fine on the Thirteen. Keep up the good work on the KLHs. The black knobs look real classy. 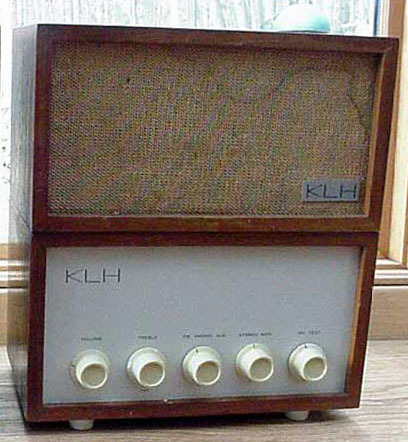 Just wanted to add that I've seen a model thirteen with black KLH knobs and black feet, but only one. It likely was a customer request, or they were ordered via mail back in the early 60s from KLH to match a model Eights knobs. The Thirteen looks good with the black knobs.....nice job. Now I have a bit of a dilemma. The white (ivory) knobs on the thirteen are not the same as those on the Eight. The Eights had flatted shafts so the knobs had metal inserts. The Thirteens had splined shafts, like the later Eighteen and Twenty-One. Makes me wondered how they put black knobs on that Thirteen you saw. Were there black knobs for splined shafts? Go To Topic Listing Members Pictures - Speakers, Electronics, etc.